The Robotech drum unloaders are used for the processing of thermoplastic adhesives whether used with 20, 50, or 200 liter containers. 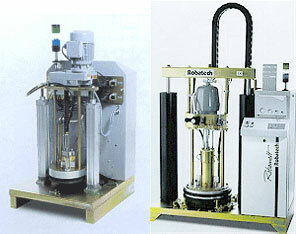 When processing large amounts of hotmelts, difficult sealants, or PUR hotmelts, the drum is the ideal means of delivery. Smooth walled steel drums are ideal, but the system can handle cardboard and synthetic drums provided they are resistant against the pressure and the heat of the melting plate. Easy to operate air bleed and exhaust valves allow a fast drum change. High melting rates with approx 5000 cm2 melting surface.